According to The Reporter, California decided to implement the tradable permit policy for the production of oil, which is responsible for the global warming. The government has budget deficit of “$9 billion” and it hopes to gain “$14 billion” by 2015, profiting from auctioning tradable permits to the oil companies. The main reason for implementing tradable permit policy is that there is a negative externality associated with the production of oil. The social cost exceeds the private cost and this makes the society to take care of the environmental cost. In order to internalize the cost of pollution of the oil production and move the quantity supplied from Q market to Q optimum, the Californian government introduced tradable permit. The government or EPA sets the amount of pollution allowed and auctions the pollution rights (tradable permits) to the oil companies. 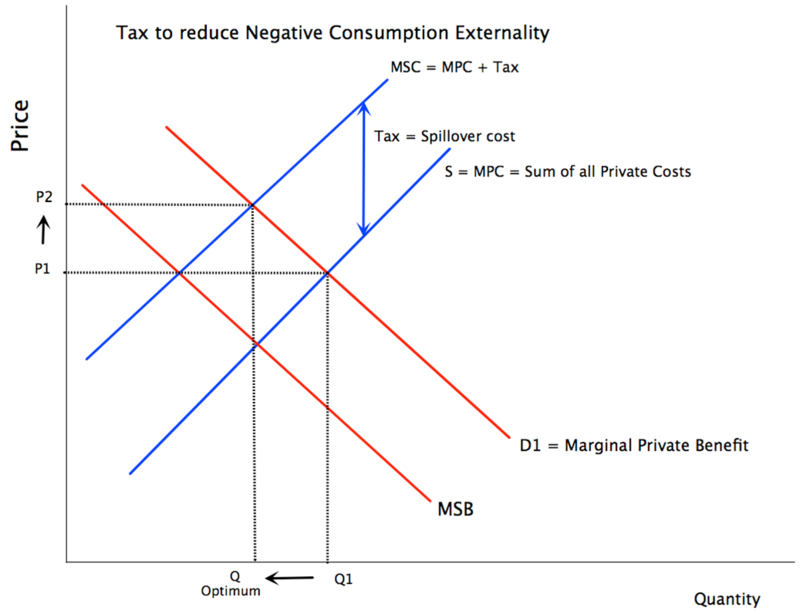 If the amount of tradable permit is appropriately chosen, it effectively moves the quantity supplied to Q optimum both eliminating the negative externality and increasing the government profit. The government would profit P times Q optimum amount of money. However, some critics argue that the increase in the price of oil will increase the overall price of consumer goods. The cost of production will increase for virtually all the consumer goods that are produced from oil-running factories. Also, the means of transporting goods from city to city will be more expensive. All this will contribute in increasing the price of consumer goods. The economic size (or social welfare) would decrease also. The overall increase in the price of oil and the price of consumer goods will lead to the decrease in the consumer spending overall. United States, especially California, is a place where the public transportation is not as advanced and popularly used as Korea. People usually drive their cars to go to work and go shopping. The increase in the price of oil will act as a disincentive for the people to go out on shopping. This will shift the demand curve from Demand 1 to Demand 2 decreasing the price of consumer goods from P2 to P1 and decreasing the quantity demanded from Q1 to Q2. Again, the economic size (or social welfare) will decrease. Some argue that the tax revenue form the taxes such as VAT will decrease countering the benefits by profits from implementing tradable permits. In conclusion, the tradable permit will increase the profit of Californian government and at the same time cut down the level of pollution contributing to the global warming. However, the government should be fully aware of the complicated consequence or unintended effects of implementing any sort of policy distorting the market will have.